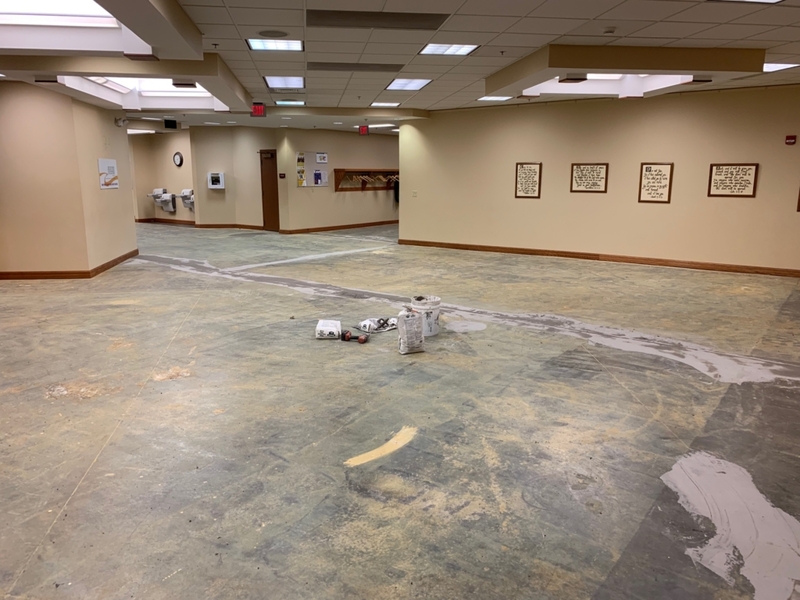 We are in the midst of replacing our carpet in the Community Center and the main hallways of the church. 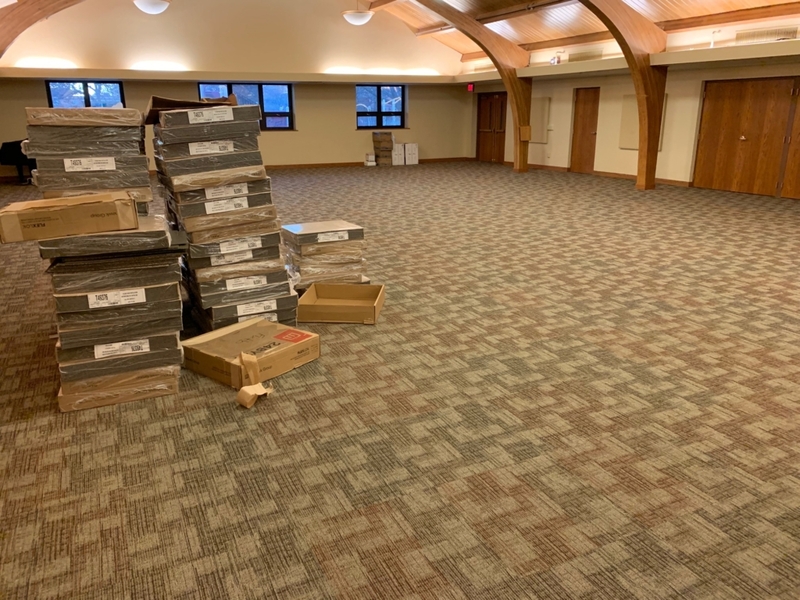 It almost seems crazy that we are having to replace carpet after just over 10 years, but for me this is a sign that our building is being used for a variety of things in addition to church activities and Hesston College events. There’s a reason why it’s called the community center: it’s a space that can be used for community events and needs. And the hallway carpet is being replaced because we value accessibility. The carpet was beginning to bulge in some places, creating a safety concern and access issues for those with reduced mobility. Despite the price tag for replacing all this carpet there was no question that it should be done and was accepted unanimously by the council without push-back. We are also repainting our children’s wing after the Hesston Community Daycare was there for over a year while their facility was being rebuilt. Another sign of the building being used for more than just church. If we are blessed to be a blessing, and part of that blessing comes in a spacious facility, then we are happy to share what we have for the benefit of all! Argentine Mennonite Church has been a presence in the Argentine neighborhood of Kansas City for over 90 years. The church sees itself in a “relaunching phase” as they try to change patterns that have been part of the congregational culture for some time. Their main contacts with the neighborhood are: the Lunch Buddy outreach; connections with The Snack Shack, an after school program for Jr. & Sr. High School students; and Venture Club, an every other Wednesday evening children’s ministry. All are part of the greater mission of mentoring at-risk kids, many of whom are part of the 1400 homeless kids in the KCK area. The Lunch Buddy outreach is a partnership program with New Stanley Elementary School across the street the street from the church. Members of the congregation are paired with students identified by the school as needing good mentorship and Argentine persons have lunch regularly with those students. The congregation and the school recognize that the needs far outweigh the available persons. Pastor Sandeep is preparing a presentation about the mission, work, and needs of the church to present in other Conference congregations in the hopes of attracting additional persons to join their ministry in Kansas City. New Hope Fellowship is a small gathering of believers located in Perryton, TX. The group is lead by Pastor Bob Humphrey. In a recent communiqué, Pastor Bob declared that “Perryton is ripe for revival,” after noting drops in Sunday morning attendance in churches all across city. In response, he and others have begun a men’s bible study believing God will use it to reach out to men in the wider community. The bible study is a time to engage God’s word and pray for His transforming power to be made manifest. Fruit from the creation of this men’s bible study has already start to emerge. Two new men from the community have joined the group’s number. In addition to numerical growth, Pastor Bob has identified that the time spent together as men in prayer is giving them all a much needed uplift. May God bring revival to the Perryton community. – Jeff Selzer, SCC RCM. On Wednesday the 17th of November, the youth group of Iglesia Menonita Rey de Gloria (King of Glory Mennonite Church) gathered for a surprise party for the district’s newest ordained pastor in the area. Pastor Mayra began as the Youth Pastor for the church. Since then, she has transitioned into being the pastor for Rey de Gloria and was ordained at the UCIM annual assembly on November 3rd. The kids still refer to her as “their Pastor.” Pastor Mayra states that she really was surprised by their show of support and love. Mayra is now working toward her Masters in Divinity at the Shalom Biblical Institute in Brownsville. We wish her many years of service in the Lord’s work. “Run the race Mayra”.